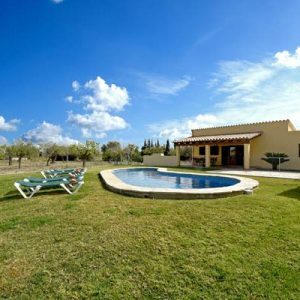 This finca is one of the finest examples of a superbly reformed original farmhouse in the Pollença area. This is a delightful private family owned property, located midway between Pollença old town and Puerto Pollença, in the much sought after area of La Font. Set in well maintained gardens and mature trees surrounding the crystal clear swimming pool with Roman steps. The walled gardens are an absolute delight with mature Palm trees, colorful bougainvilleas, scented herbs and lawned area for children to play. An added interest for the children is a small aviary.